That evening, I walked in just before the PaB bell rang. Adams was already there, waiting. Pema Pera: ah, the bell! Adams was refering to an enthusiastic email that she had sent me, about the koan I had given her the evening before, just 24 hours earlier. Syl then joined us, after I had given her the tp she had asked for. Sylectra Darwin: Hi Pema! Thanks for the lift! Pema Pera: rather than a line at a time here. Pia Iger: do I miss anything? Pema Pera: Adams, do you want to share with Syl and Pia what you found? Pema Pera: we just arrived here as well! Pia Iger: not a bad thing, very motivated!! Sylectra Darwin: That is a really good thought, Adams. Pia Iger: what is the koan? Adams Rubble: who is impatient? Pema Pera: thank you, Adams! Pema Pera: to let Being play. Pema Pera: Adams, would you like to share a bit more what happened, and especially how you were stuck for a while? Adams reported and gave away the secrets of her explorations. Pema Pera: you’re very systematic! That is where the notion of lab journal writing really helps. I have mentioned earlier the strong parallel I see between scientific research and working on koans — this is a beautiful example! Including turning away for a bit, to let something fresh bubble up. Sylectra Darwin: Good, I am happy to hear about that, Adams. Pia Iger: I feel I am quite relaxed about the practice now. Sylectra Darwin: do you write the log during the 9 seconds or after? Pia Iger: Mindfulness is what I found first in practice too. Adams was really systematic about all this, which was great! Sylectra Darwin: so do you prep yourself for the 9 seconds, like with breathing? Pia Iger: focus on body is a good way to center yourself, I think. Adams Rubble: Why am I impatient? Pema Pera: The two feed on each other: getting excited about practice can lead you to writing — and writing can help you to get more excited, involved, galvanized, into it. Pema Pera: but those are words, ideas . . . .
Sylectra Darwin: I’ve got to try that. Pia Iger: Recently, I feel there are so much more can be appreciated in life. Pia Iger: which I did not notice before. Pia Iger: I think overall I am more relaxed. Ah, appearance! One of my favorite terms, and what gave the name to the “Hall of Apperance” which we built nearby. Pema Pera: What does Being present? Pema Pera: and what can we do with that? Pema Pera: once you learn to subtract, it all becomes very easy. Sylectra Darwin: i look forward to learning that. We talked about how simple it all is. Pia Iger: traditionally, enlightenment progress seems quite painful. Pema Pera: Syl, a key point is that once you see something more, deeper, you realize that you had already known it in some way — Adams, you wrote something like that, too, didn’t you? Do you want to comment on that? Pema Pera: when we tell ourselves “I don’t see it” we reinforce the illusion that we don’t. Sylectra Darwin: I like it. Pema Pera: what to tell ourselves? Sylectra Darwin: How about inviting ourselves to see it? Pema Pera: or inviting ourselves to recognize that we *already* see it . . . .
Adams Rubble: Is it foolishness, courage? Pema Pera: wanna watch Adams get eaten, Syl? Dakini walked in, followed quickly by Gar whom Syl had teleported in. Sylectra Darwin: there he is. Sylectra Darwin: Everyone, this is Gar. Dakini Rhode: hi Gar ! Pema Pera: Did Syl tell you what we are doing here? I gave a micro-explanation of PaB. Pema Pera: And we keep chat logs — do you mind to appear in it on our blog? Pema Pera: Have you met Dakini, Gar? Sylectra Darwin: And Dakini is often shiny. Pema Pera: Dakini, do you want to summarize your Zen Retreat practice too? Pema Pera: Pia and Adams both talked about being confused . . . would you like to say something more about that? Pia Iger: yes, seeing and not seeing part. I commented on Gar’s great quote. Pema Pera: In our case: Being cannot be spoken about — and we are trying not to misunderstand “Play as Being” too much . . . . .
Pia Iger: Gar already sees. Pia Iger: really, I just saw it today. Pia Iger: I just knew her name today. Pia Iger: good to know. 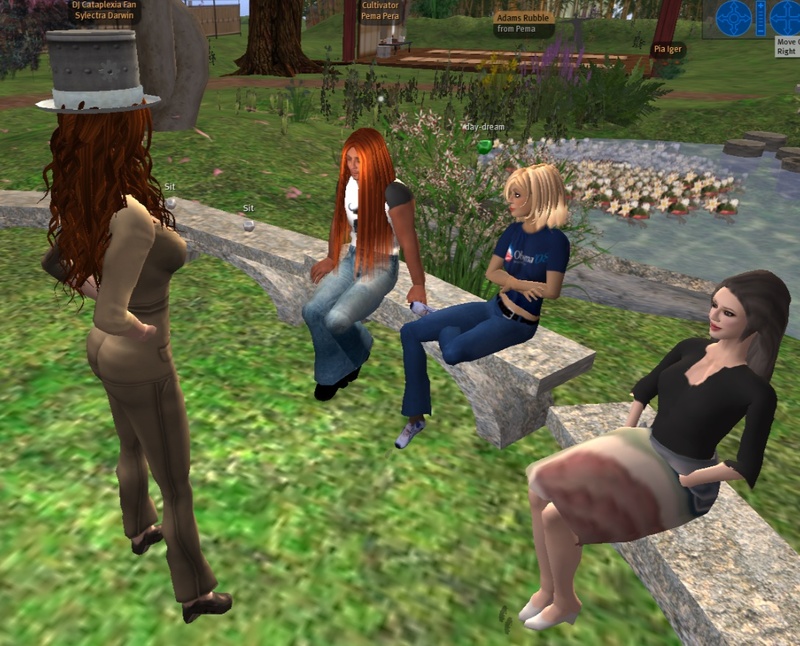 Pema Pera: I would have gone had I had the time . . . .
And I would go, soon afterwars, to the second meeting, at Tuesday evenings, 6 pm SLT. Pia Iger: I will check it out. Pema Pera: Hi Stevenaia, we were just talking about you!! Steve dropped out of the sky. I looped back to Adams’ adventure, earlier that day, as an example of suddenly seeing what really never had been hidden in the first place, and what could not have been found by grasping. Pema Pera: from your own experience? Gar Hallard: what do you mean? Gar Hallard: as ive said ive only just started..a koan? Gar Hallard: what was it? Gar Hallard: what were you trying to answer? Adams described the sense of seeing what had been staring her in the face. Pia Iger: So Adams got a tast of finding something that is already there? Pema Pera: what do you think, Adams, how did that feel? Sylectra Darwin: OK, don’t want you to miss that. Pema Pera: sorry to have so little time Clytemestra! Pema Pera: Nice meeting you Gar! Clytemestra Dezno had walked up to us, but alas, I couldn’t miss my train. Pema Pera: so plenty of time to catch each other again! Pema Pera: Steve, can you continue the chat log? Pema Pera: Goodnight to you ! Pema Pera: bye, Pia, Gar, Syl, Dakini, CLyte, Steve, Adams! Sylectra Darwin: Bye for now.